Looking around the site there are listings for a few unannounced games including Epic Yarn 2 (thanks to Josh in the comments for that one). Oh well it was nice to be excited whilst it lasted… anyone wanna take bets on when something is announced? ORIGINAL STORY: Norwegian retailer CDON.com has posted a listing for a new Sonic game on the Wii-U, simply entitled “Sonic (Nintendo Wii U).” The retailer also has a listing for a ‘Super Monkey Ball Cafe’ game on the same system. For those who don’t know, ‘Cafe’ was the code name for the Wii-U. Now obviously the thinking is, ‘maybe this is their listing for Sonic & All Stars Racing Transformed?’ Well this is what makes the listing a tad interesting, the site already has a listing for ASRT on the Wii-U. As of yet, there has been no official word on a new Sonic game for any system outside of ASRT, so this might be be an error on behalf of the website. It would be crazy to assume that a Sonic game won’t ever be made for the Wii-U. However, is this listing a sign one is on the way? Or has the retailer got it very very wrong? Super Monkey Ball Cafe listing. It’s just very hard to believe this retailer in particular isn’t pulling stuff out of their arses to generate a little hype and/or controversy. It’s also unfortunate that all it takes is a big retailer blunder in order for the majority to believe it as fact. So yep for now I’m taking this as a pinch of salt, even if a WiiU Sonic is inevitable I don’t think this confirms it. Yeah. I mean, Wii U. It’s one of the next gen’s consoles. Sonic is gonna be on the system, anyone can predict that. This doesn’t mean they’re ready to announce a specific project. Aye just had someone else point out aparently this is common practice for retailers in Scandinavia to do this… oh well… Back to playing cards. I was going to say “Here we go again”, but then the update came out. I honestly don’t think there will be a new Sonic game announcement until Spring 2013. More specifically, I think an announcement, whether an announcement or announcement trailer, will come during February. And a leak will come out some time before that! And again Sega leaves the vita with one sonic game…. So, maybe it’s too optimistic, but we’ll see. Probably. Sega Hasn’t gone bankrupt yet. 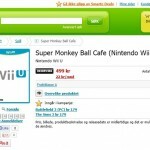 Super monkey ball cafe? That’s something i would love to see. As for Sonic Wii-U is this what people ment by the Rumor “Sonic Dimensions”? Or can this be episode 2 for the Wii-U? Yeah, but Izuka (I think) said it was a hoax, while awkwardly holding Sonic 4 episode 3 art behind his back, covering the latest script, and waving off the guy with the updated cast list. Probably for the same reason people are buying the system for Bayonetta 2.